That is how Dino Ciccarelli self-effacingly describes the style of play that saw him score 608 goals in 1232 career NHL games, a mark that is good for 17th all-time in league history and sees him as one of only 18 players to surpass the 600-goal mark. On Monday night, Ciccarelli will receive one of hockey's greatest honours for the efforts of his 19-season career; entrance into the Hockey Hall of Fame. Ciccarelli entered the NHL with a flourish, kicking off his NHL career with a still-standing rookie record for playoff goals after a late season call-up to the Minnesota North Stars. Dino scored a remarkable 14 times during the North Stars run to the Stanley Cup Finals in 1981. Playing the gritty, stand-in-front-of-the-net style that was his trademark, Ciccarelli knew where to go to collect goals from a young age and he was not afraid to pay the price needed to get them. It was his goal-scoring that gave him an opportunity to make the league in the first place, albeit one that Ciccarelli had to fight to get. Despite scoring 169 OMJHL goals in four seasons with the London Knights and out-scoring Wayne Gretzky's 70 goals in 1977-78 (“he did blow me away in assists though” Ciccarelli now jokes), he suffered a broken leg at age 17 in the OHL playoffs that season, during a practice with his Knights teammates, and was told that the chances of playing hockey at a high level again were slim. With determination, hard work and support from his parents (who have sadly passed away in recent years), the Knights' training staff and his billets, Ciccarelli made it through the grueling rehab that was required to heal the leg. “I would have never made it through those two years without them,” Ciccarreli says now, looking back on that time in his career. And score goals he did. With two 50-goal seasons, four 40-goal seasons and 73 goals scored in 141 career playoff games, Ciccarelli carved a niche for himself in the game by setting up in the eye of the storm, in front of the opposition's goalie. There he would cause traffic, disrupt the goaltender's vision, dig for rebounds, get sticks on pucks, get body parts on pucks, or anything else that would help get the puck in the net. 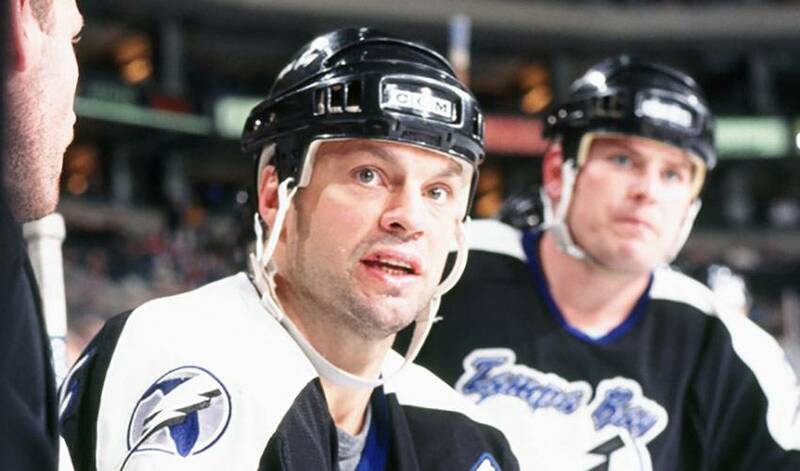 For his willingness to do it through 19 years in the NHL, Dino Ciccarelli will enter the Hockey Hall of Fame in Toronto on Monday night, in what will be his first time ever in the building. Similar to the hockey player's ritual of refusing to touch the Stanley Cup until he has won it, Ciccarelli has shied away from the building, having never visited it until this past week. Following his formal induction at the ceremony on Monday night, Ciccarelli will have all the opportunities he wants to get familiar with the place, after making a career of becoming familiar with the places few other hockey players were willing to.